Diamonds are known as the ultimate symbol of jewelry status, and this Apples of Gold solitaire ring takes that symbol to a whole new level with the intriguing black diamond. The 0.50 black diamond gives an ultra-modern approach to the diamond solitaire ring. Its deep ebony color brings a unique depth to the ring because Apples of Gold only uses diamonds that are hand-selected for color, consistency and clarity. This black diamond is secured in an elegant four prong setting that leads into a solid 14K white gold band. Also available in 1.00 Carat or 2.00 Carats. 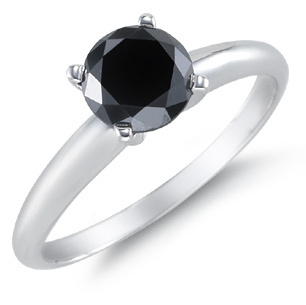 We guarantee our 1/2 Carat Black Diamond Solitaire Ring to be high quality, authentic jewelry, as described above.